The M4 Relief Road is expected to cost more than £1.4bn once VAT is taken into account, a senior Welsh Government official has told AMs. Simon Jones said it was not yet clear what VAT would need to be paid. Welsh Government recently announced it had committed to spending an extra £135m to improve Newport Docks - pushing costs up 10% to £1.3bn. Labour Llanelli AM Lee Waters feared costs could rise to as much as £1.5bn. The motorway project is currently subject to a public inquiry. It has faced opposition from environmental groups and some AMs, although Associated British Ports dropped its objections after the investment was announced. "The figure that has been lodged with the inquiry is between £1.3-£1.4bn," Mr Jones, director of economic infrastructure, told a meeting of the assembly's economy committee. "The VAT situation is quite complex with that road. It applies to some parts of the scheme and not to others," he said. He said conversations taking place with HMRC at the moment to understand the VAT implications of the scheme. Pressed on whether the cost would be more than £1.4bn after VAT, by Labour AM Lee Waters, Mr Jones said: "Yes." 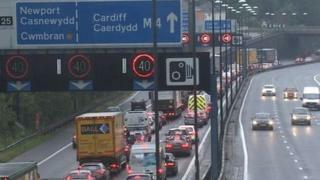 Mr Waters asked if there was a "tipping point" where the M4 was no longer value for money. "It would have to increase massively," economy secretary Ken Skates, who was also giving evidence, said. Mr Skates said he "understood members concern" about £139m being made available for work at Newport docks. "That investment will ensure that Wales becomes a more attractive place for investors," he said. After the meeting, referring to comments by the first minister in late 2015, Mr Waters said: "Two years ago it was being claimed that a new M4 would cost nowhere near £1bn. Now it's clear that it will cost at least £1.5bn, and take longer than expected, and that's before the likely legal challenge. "Using the standard government measurement the new section of M4 is not classified as good value for money. "We need to debate whether if there was a free hand to spend £1.5bn on projects to benefit the economy across Wales would this be the best way to spend it." In 2015, First Minister Carwyn Jones predicted the relief road would cost "nowhere near" £1bn.